The Peggy Guggenheim Collection is one of the most important museums of modern art in Italy. It is located in the south of the old town of Venice in a palace, nest to the big waterway Canal Grande. As with many of Venice's major attractions, the Peggy Guggenheim Museum often has very long queues, so we recommend you buy your tickets online in advance. The Guggenheim tickets are available online on Getyourguide.com with free cancellation until one day before the chosen date. There is a 3 Euro extra fee, for most museum visitors better than waiting a long time. You can also find tickets for other top attractions nearby on Getyourguide.com. The waiting times at the Doges Palace Venice and at the St Marks Church were also enormous. Peggy Guggenheim (1898 to 1979) was an American millionaire. Her great passion was collecting works of art. She lived in Venice from 1948 until her death in 1979. In 1949 she bought the Palazzo Venier dei Leoni where the museum is located today. The Peggy Guggenheim Collection opened a year after her death in 1980. The palace Venier dei Leoni, which Peggy Guggenheim bought, was never completed. Only the ground floor exists. Works by Wassily Kandinsky, Piet Mondrian, Pablo Picasso, Max Ernst, Paul Klee, Salvatore Dali, Rene Magritte, Marcel Duchamp, Alexander Calder, Francis Picabia, Constantin Brancusi, Alberto Giacometti, Giorgio de Chirico, Albert Gleizes, Georges Braque and Jean Metzinger are on display at the Canal Grande. The founder of the exhibition was married to Max Ernst for several years in New York in the 1940s. Important paintings in the Guggenheim Collection Venice include three works by Picasso: "The Poet", "Sulla Spiaggia" and "Pipe, Glass and Vieux-Marc Bottle". "The Clarinet" by Georges Braques is one of the world-famous paintings in the Venice Art Museum. The artwork by Dali "Birth of Liquid Desires" should not be missed either. On the terrace towards the Grand Canal you find a bronze rider by Marino Marrini (1901 to 1980). The equestrian figure "L'Angelo della Citta" or "Angel of the City" from 1948 is considered the most important work of art in the Peggy Guggenheim Collection. The whole garden with beautiful sculptures is worth seeing. Here you can also find the tomb of Peggy Guggenheim and the tombs of her beloved babies (her dogs). Among the sculptures in the garden are works by Max Ernst, Hans Arp and Henry Moore. The entrance fee is generally around 15 euros. Children under 10 years pay no entrance fee. Older children pay 9 Euro. There are also small discounts for students, pensioners and other groups. We recommend to buy an online tickets for the Guggenheim Museum Venice because of the large number of visitors. Such tickets from the Internet cost about 3 euros more. However, this can be very worthwhile, as the queues in front of the Guggenheim Gallery are often very long. You should make sure that you buy online tickets with the addition "without queuing" or "skip the line" (see yellow box below). To our knowledge, the collection can be visited every day except Tuesday from 10 am to 6 pm. On some public holidays the exhibition is also closed. You should ask for an audio guide. The art museum is in the south of Venice. Location of the Guggenheim Collection: The district in which the Guggenheim Collection is located is somewhat off the beaten track in Venice. Behind the Palazzo Venier dei Leoni you can still find a fewnice restaurants in small alleys, which are not totally touristic. We have also discovered some fast-food stalls (such as pizza, kebab) with normal prices. 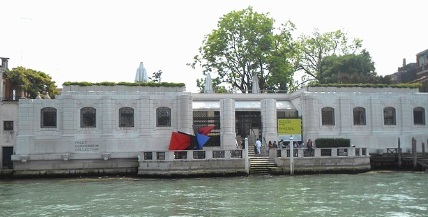 Access by public transport: The Museum of Peggy Guggenheim can be reached by water bus. The nearest vaporetto (water bus) station is Salute (about 10 minutes walk, church worth seeing). Here, however, only the rather slow water bus line 1 stops, but you can also get off at the jetty Accademia (about 15 minutes on foot). Line 1 and express line 2 stop here. Other Guggenheim Museums: The Peggy Guggenheim Collection in Venice is not the only museum in the world named Guggenheim. The Guggenheim Museum in Bilbao (Spain) and the Solomon R. Guggenheim Museum on Fifth Avenue in New York are particularly famous. Name of the museum: In English, Peggy's mother tongue, the Modern Art Museum in Venice is called the "Peggy Guggenheim Collection". This museum name is also becoming more and more established in Italian. 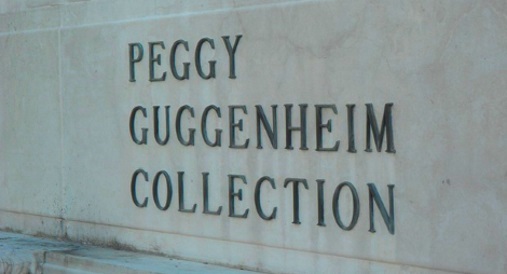 The name "Collezione Peggy Guggenheim" also exists in Italian. Artistic style: The paintings and other works of art in the Peggy Guggenheim Collection are almost all from the first half of the 20th century and are mostly by artists from Europe and the USA. Various styles of Modern Art are represented, including Surrealism, Cubism, Futurism and Expressionism. Peggy was a big fan of surrealism. Peggy Guggenheim was for about 5 years married to Max Ernst, one of the most famous surrealists worldwide, . Museum building and history of the museum: The palace "Palazzo Venier dei Leoni" is directly on the Canal Grande, you can see the building well when you go past it with the vaporetto. It is the only bungalow in the area, all other buildings on the Canal Grande are multi-storey. Palazzo Venier dei Leoni was built around 1750 by the architect Lorenzo Boschetti. A multi-storey building was planned. Probably for lack of money the building was not completed until today. In 1949, millionaire Peggy Guggenheim bought the house on the Canal Grande. Until her death she lives in the palazzo, the garden belongs to her beloved dogs. Until her death in 1979, the many works of art were not open to the public. In her will, Peggy Guggenheim decreed that after her death her palace in Venice should be a museum of modern art accessible to all people. Some more works were added after her death. However, the majority of the paintings and sculptures in the Peggy Guggenheim Collection Venice are still from Peggy Guggenheim. It is one of the great museums of modern art in Italy and Europe.